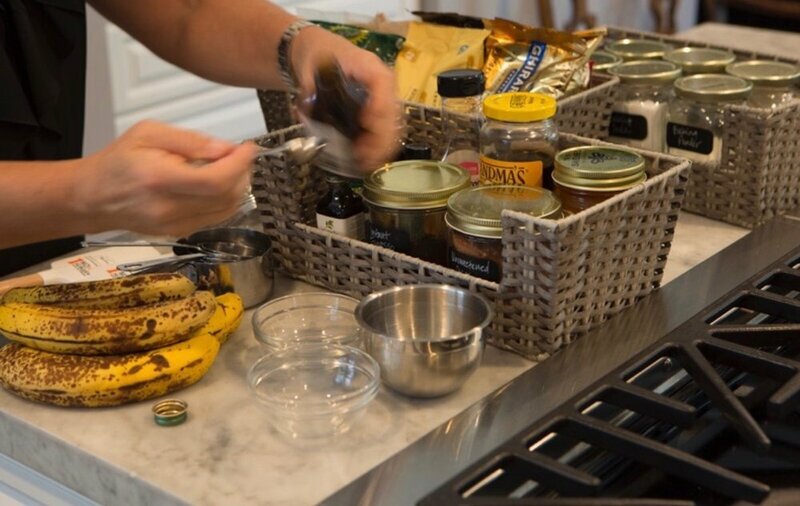 There’s no better time to implement kitchen organizing habits than when you move into a new home (or have recently remodeled your current one). Moving can be an arduous process, but if you put some TLC into organizing each space, especially the kitchen, it really pays off! Hopefully your designer, contractor or architect has planned your kitchen with you in mind, and has designed the most efficient kitchen space for your particular type of use. What kind of kitchen dweller are you? My recent posts have talked about a lot of different types - read them here if you're not sure which type you are! Here are a few of my best practices for setting the tone and starting your sparkling new kitchen off on the right foot! Pot and pan storage should be as close to the stove and oven as possible. This ensures minimal lifting and hauling as they tend to get heavy. Similar to pots and pans, wooden spoons and spatulas, cooking spoons, slotted spoons, ladles, potato mashers – anything that you may want to reach for while over the stove or using the oven – should also be kept as close as possible. Rubber spatulas are also handy when cooking or baking and can be kept in a drawer or in a utensil crock near the oven. I keep separate rubber spatulas for both baking and cooking, and DO NOT mix them. I think we've all made the mistake of cooking a garlicky or spicy meal and then using the same spatula for cookies. Not a good idea! Ask me about these custom-fitted drawer organizers! Knives, peelers, mandolin, garlic press, microplanes all go in a divided utensil drawer together. I opt for these custom-fit drawer dividers to keep all these little gadgets as tidy as possible. Cutting boards go together in a low cupboard with dividers. Measuring cups (wet and dry), measuring spoons, and other baking tools are also kept together for when you're whipping together a batch of something sweet. Mixing bowls and prep bowls - a lifesaver when you're prepping a complicated recipe! These often are made to nest within each other, making for tidy storage in a low cabinet. Dish towels: I keep these close to the sink, of course! Appliances such as food processors and mixers I keep either in a pull-up platform, or a pull-out shelf in the cabinet below. (I am not a fan of keeping these out on the counter tops). The Breville brand is a favorite of mine for food processors, as it comes with its own blade storage and other great food prep features. Kitchen Aid mixers are another favorite. The Vitamix is a lifesaver for smoothies and to puree sauces and soups! Also, if the dishes are near the eating area, no one will get underfoot if they are trying to help set the table while you are finishing up dinner. This is for peace of mind as well as safety in my book! Tea and coffee cups/mugs should be in their own cabinet with pitchers for milk, etc., and kept as close to your coffee/tea prep area as possible. Placemats and napkins should be as close as possible to the eating area. I keep bottoms and tops of all jars, containers and other vessels in a deep drawer that is dedicating to just storing glassware. I try to only buy the same style, in a few different sizes. I store the tops in magazine dividers. This way they fit nicely into the drawer for storage. Aren't they lovely all lined up like this? Baking goods like sugar, flour, baking powder, etc. Snack foods like chips, mixed nuts, trail mix, etc. Pickled items like capers, olives, etc. *with the exception of some glass bottles of oils that I keep on a silver tray near my stovetop. By dividing your kitchen into sections like this, you'll set up a system for organizational success for the life of your kitchen! 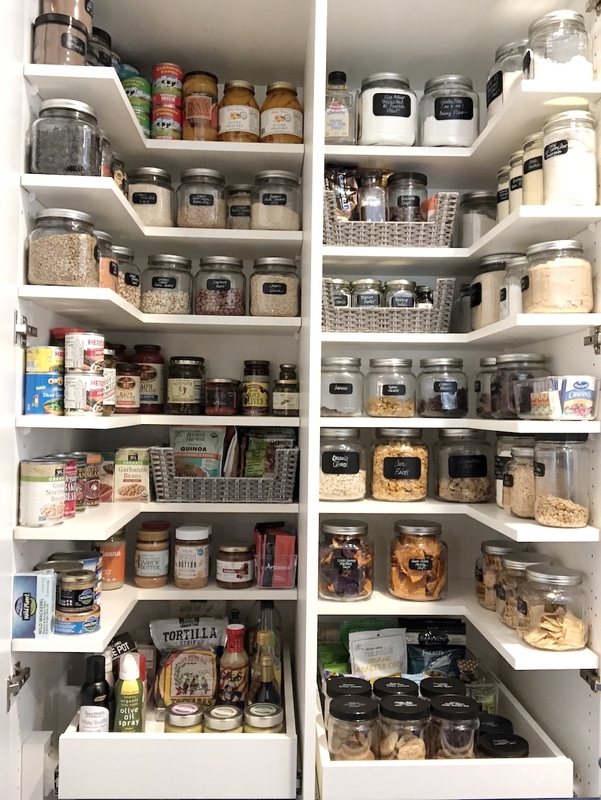 I do offer free consultations so if you’re interested in having me come by your new home (or newly remodeled home), I would love to help you save time and organize your kitchen to be systemized and organized! Please contact me here.